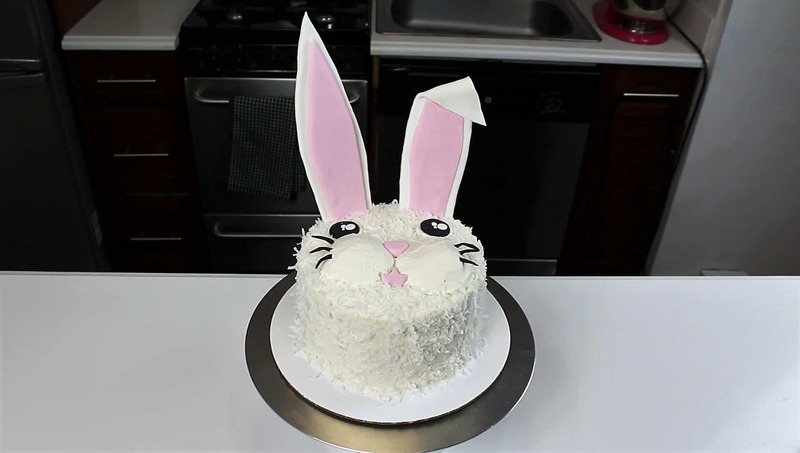 Since it’s finally spring, I decided to make a super easy rabbit cake! It’s so easy to make, I actually making it as part of my live stream for the Food Network, which can be seen here! This cake is covered in coconut buttercream, and shredded coconut, so you don’t have to worry about frosting your cake perfectly smooth. 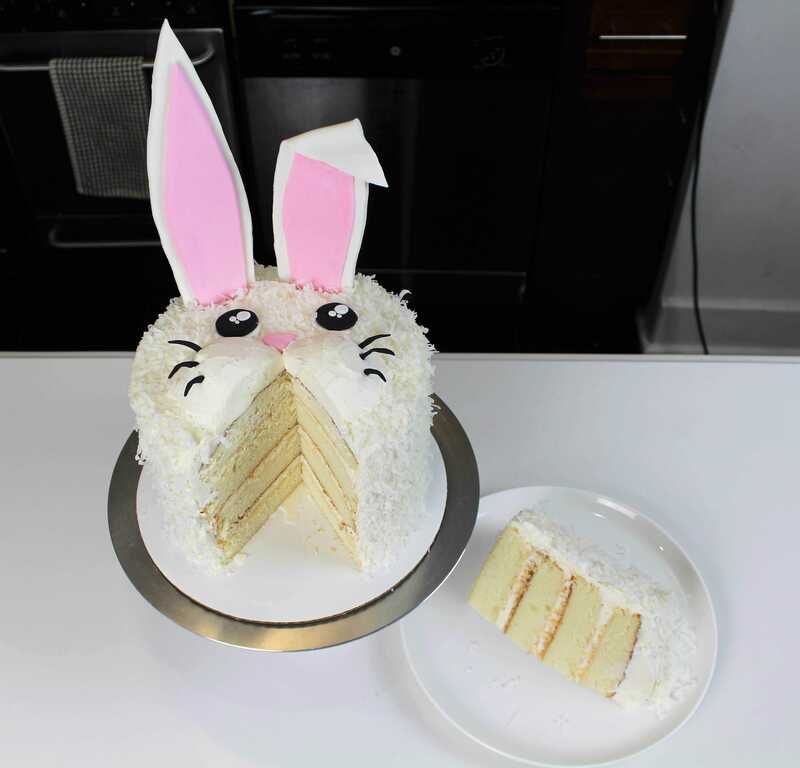 This cake is a perfect way to celebrate spring, or could even be a fun Easter dessert! It also is perfect for anyone who loves rabbits! The recipe can be found below. While the cake layers bake and cool, prepare the coconut buttercream. Beat the butter on high for 30 seconds, until smooth. Slowly add in the powdered sugar, 1 cup at a time. Alternate with small splashes of cream. Once fully mixed, add in the vanilla, coconut extract, and salt, and beat on medium low until the ingredients are fully incorporated, and the desired consistency is reached. Mix the buttercream on low at the end of the process for a couple minutes, to get out any extra air that might have be incorporated during the mixing process. This will make it easier to get smooth sides on your cake. 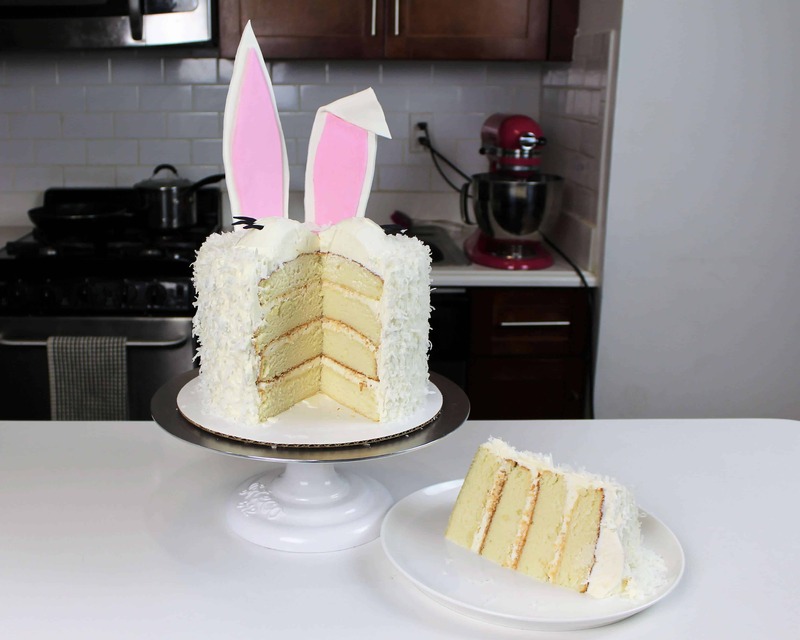 To assemble the cake, stack cake layers and apply an even layer of coconut buttercream between each layer. I also chose to sprinkle some toasted coconut between the layers. Once stacked, I applied a thin crumb coat to the cake, and chilled the cake in the freezer for 5 minutes to allow the crumb coat to firm up. I then applied a thicker, second layer of buttercream, and covered the cake in shredded coconut. I put some left over buttercream in a pipping bag, and added a tail and cheeks to the cake. I then added fondant ears, eyes, mouth, whiskers, and a nose to the top of the cake. I made these the night before to allow them to firm up before placing them on the cake. you are such a darling. your tutorials are very easy to grasp,especially for beginners like me. How many coconuts did you use to get the shredded coconut u used for decoration. moreover,what other method can I use to dry the thin crumb coat before coating the second layer, as I don’t have a freezer or fridge to dry it up that fast. is it alright for me to use salted butter for the frost? it is really difficult getting unsalted butter here in Nigeria. Sure! just don’t add an additional salt! Do you make your own fondant? If so, can I find the recipe anywhere? I don’t! I use the satin ice brand! yes whipping cream will work for the buttercream! !